Sand dunes’ graceful curves and intricate textures move and intrigue the eye, and few things better convey nature’s purity than a windswept dune. Ironically, it’s the dunes’ aesthetic magnetism that hastens their demise as photographic subjects—their fragile sand, so easily sculpted by Mother Nature’s fickle winds, is hopelessly marred by any contact with the humans drawn by their beauty. While Death Valley has several sets of dunes, by virtue of their ease of access, the most popular by far are the Mesquite Flat Dunes near Stovepipe Wells. Every day hundreds (thousands?) of gawkers seeking a closer look trudge up and down the undulating sand—with each footstep a small amount of purity is lost. Fortunately, it’s rarely long before Mother Natures has had enough and sends in scouring winds that erase the scars like a shaken Etch-A-Sketch. This year’s Death Valley workshops landed in the middle of an extended static without significant wind, so I knew pristine sand would be hard to find. To minimize the footprints I take my groups to a spot that’s away from the tourist foot traffic, but this time I knew that wouldn’t be enough. Nevertheless we gave it a shot and managed to find enough patches of untouched sand to isolate with a telephoto and everyone was satisfied. Except me. So when a stiff wind kicked up the afternoon of our final full day in Death Valley I took them back out to the dunes with fingers crossed. On our drive from Furnace Creek the cars were buffeted by gusts and the entire northern horizon was obscured by dark clouds that I soon realized were in part blowing sand—a very good sign indeed. I pulled up to a spot I’d scouted a few days earlier, far removed from the paved parking area and tall dunes that draw people, and surveyed the conditions. The wind whipped anything not buttoned down and pewter clouds were rapidly overtaking the late afternoon light skimming the Cottonwood Mountains. The group prepared for strong wind and blowing sand similar to the way we’d prepare to photograph in the rain, but in the five minutes it took to get onto the dunes the wind had mysteriously diminished to an eery calm. Before us spread pure, rippled sand for as far as the eye could see. And except for one distant photographer who quickly passed out of sight, we were the only people out there. Fearing a shotgun approach to setting the group free would result in inadvertent footprints marring the scenes of others, I gathered everyone and suggested that we move together and agree to stay behind a predetermined imaginary line. The problem, I explained, wasn’t just staying out of everyone’s frame, it was that each step in the sand would ruin all shots in that direction. So they all followed me until I found a nice scene with a good amount variety, which we all photographed for a few minutes before I guided them to another scene. After two or three of these cycles, it seemed everyone had become comfortable enough with the environment and the ground rules that we could scatter without interfering. I have to say that there is no kind of photography that makes me happier than what we did that evening. With virgin, textured sand and a dramatic, rapidly changing sky, the creative possibilities were off the charts. Surveying the group, it was clear that everyone was as thrilled as I was, each fully engaged in their own photographic zone. I kept telling them that they had no idea how lucky they were to be photographing these dunes without a single footprint, but I’m not sure anyone was listening at that point. Most successful images provide a clear path for the eye to follow, or an obvious place for the eye to rest—often both. With sand dunes, so much visual motion (curves and lines) and activity (texture) makes a visual resting point particularly important. 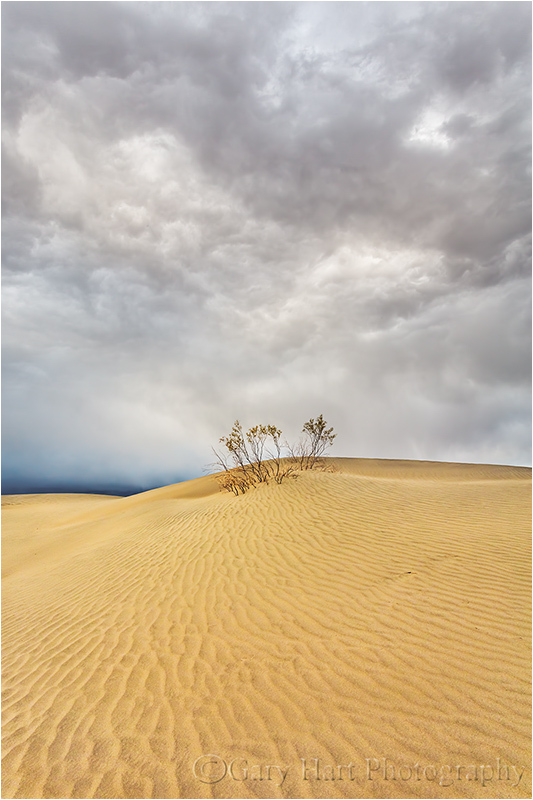 The first place I stopped the group was in front of this solitary shrub atop a low, curving ridge of sand. The scene had all the compositional elements you could ask for: elegantly arcing sand, rich texture, a dramatic sky, and a potential focal point. After pointing all this out and encouraging the group to assemble the key elements into a composition that resonates with them, I was pleased to see lenses of all focal lengths, horizontal and vertical compositions, and lots of repositioning to arrange foreground and background relationships. Surveying the scene for myself, I noticed clouds moving in from the north painted a texture overhead that complemented the ridged sand at my feet. The filtered sunlight on the western horizon, while waning, was still sufficient to warm the scene. Finding the sand and sky equally appealing, and the shrub more interesting for its lofty perch than its inherent beauty, I tried to identify a composition that incorporated these elements. To emphasize the foreground and sky, and to shrink the shrub, I twisted on my widest lens and dropped to about a foot above the sand. A vertical composition allied the dune’s parallel ridges with the frame’s long side to move the eye from front to back and created the impression that the entire world is converging on my little shrub. The vertical composition also narrowed the frame enough to eliminate incongruous clouds lowering on my left and right. I stopped-down to f22 and focused about three feet in front of my lens, ensuring perfect close sharpness and acceptable distant sharpness. A soft breeze swayed the shrub intermittently so I bumped to ISO 400 to allow a faster shutter speed. In typical Death Valley fashion, it never did rain that evening. As the storm approached, all menace and bluster, our cocoon of calmness soon gave way to sand-whipping, tripod-tipping winds that lowered a cloudy shroud onto the Death Valley Buttes and Funeral Mountains to the east, cooling the light and creating an altogether different mood (that I’ll share in a future post). Click an image for a closer look, and a slide show. Refresh your screen to reorder the display.